It has never been this easy to visualize and tell stories with your data. 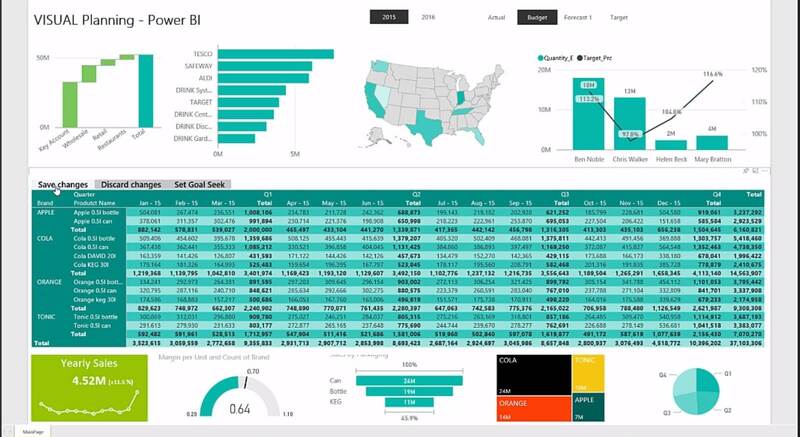 Tools like Power BI deliver real power that anyone can access and use to create great visuals that explain, clarify and amplify your message. However, if you work in Power BI you might need some help to do that. That's where Power BI custom visuals come in. These add-ins expand your options with additional visualization features that you can use to create compelling visual stories. To help you start, we're highlighting some of the custom visuals that will make your reports stand out. Power BI already has a built-in card element but Card with States by OKViz supercharges it. You take a performance measure and define multiple states that determine the colour of the visual. If the measure is positive, the card is green and if it underperforms, the card turns red. It is also possible to display the measured trend line. Powerful and simple at the same time. 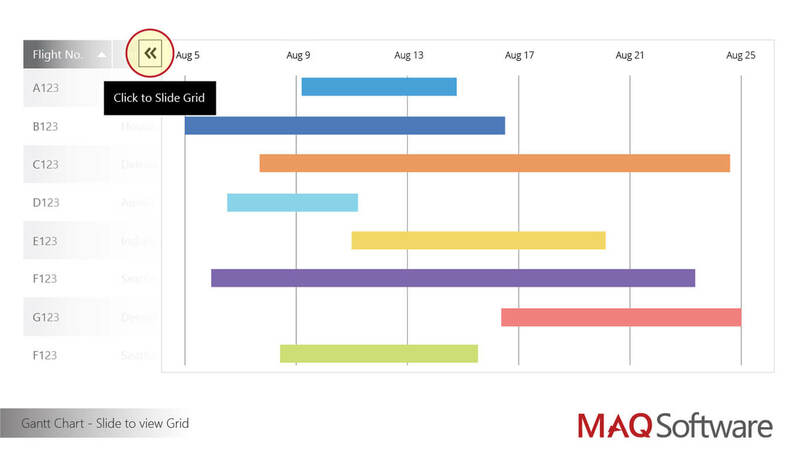 MAQ Software developed an upgrade to regular Gantt charts. It offers features such as the ability to view data related to the task and the hierarchy of data categories and to sort the data based on any data point contained in the task. 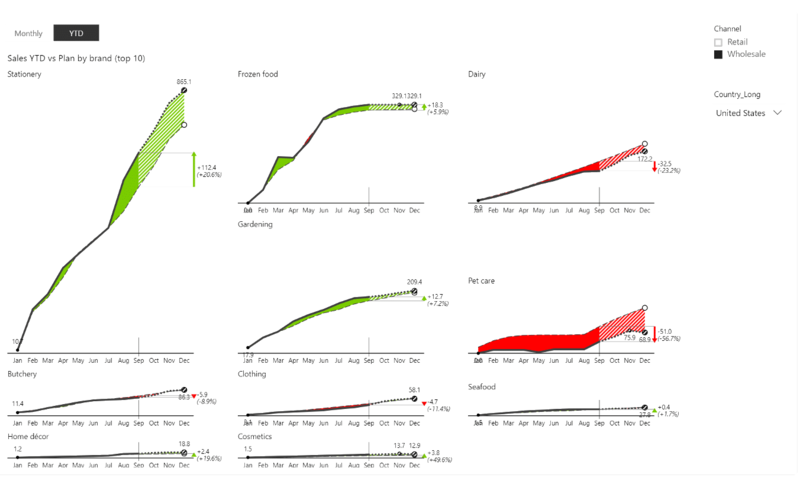 The visual can be used by project managers to monitor projects as well as by users to view individual tasks and progress. These attractive charts will definitely help you improve your project management efforts. Sometimes the most powerful things are the simplest and this custom element fits this description perfectly. 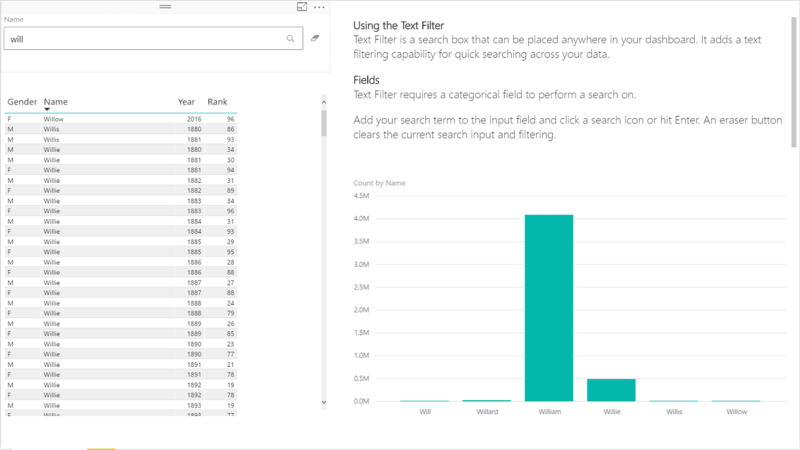 All Text Filter does is add a search box to your dashboard that you can use to filter your data. For example, we have a demonstration dashboard that displays information from hundreds of stores and to easily display just a subset of them, you need to simply enter some text, such as "new york" into the search box. The data is filtered in real time and helps you find specific content on your dashboard. Like the previous item on this list, this is another custom visual developed by Microsoft. Since Power BI is a part of its Power platform, it's no wonder Microsoft added support for PowerApps. 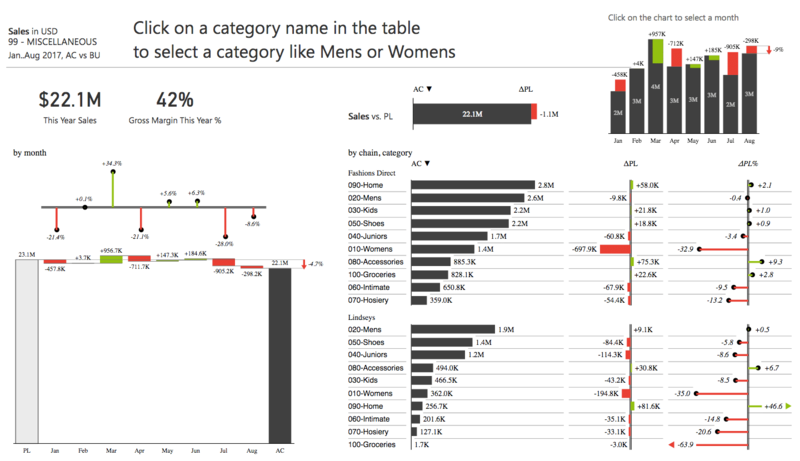 This custom visual makes it easy to bring forms and data editing to Power BI. You can even connect to external data, stored in services such as SharePoint, Dropbox, and MailChimp. It can be used to easily enter parameters for what-if analyses or to create an inventory dashboard through which you can place orders as needed. At Zebra BI, we recommend our customers add commenting functionality to Power BI using PowerApps. All you need is to create a simple app that is used to add comments, which are displayed as a tooltip or in a separate table. Currently, this is the only native option to implement live commenting in Power BI. You could also go Instagram on your data. 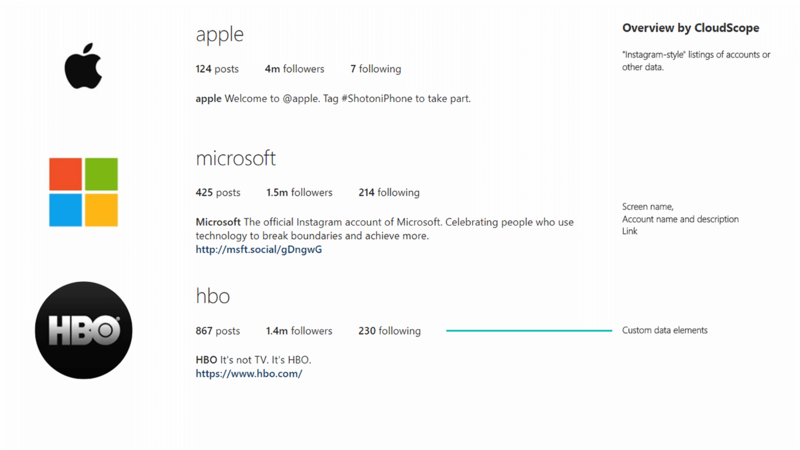 We don't mean filters but showing your list-oriented data in Instagram-like formatting. You can take data about companies and show their icons, names, hyperlinks and additional data fields and display it as an easy-to-read overview. This is exactly what Overview by CloudScope does. If you're working in multiple geographies, you often need a way to put visualizations on a map. Power BI can be extended with customizable heatmaps, point cluster maps, and graduated circle maps that are available in Mapbox Visual for Power BI. This plug-in allows you to overlay Power BI data on a satellite map. It offers several advanced features, including the ability to visualize data differently at different zoom levels through layers. In practice, this means that you receive more detailed data the closer you zoom in on the map. Slicers are a great way to switch between different filters, especially those that you use often. You might want to use more complex slicers and that's where HierarchySlicer comes in. It allows you to use a Power BI hierarchy as a slicer to filter other report items. You can expand individual levels to navigate through the hierarchy and you can use either predefined or ad-hoc hierarchies. 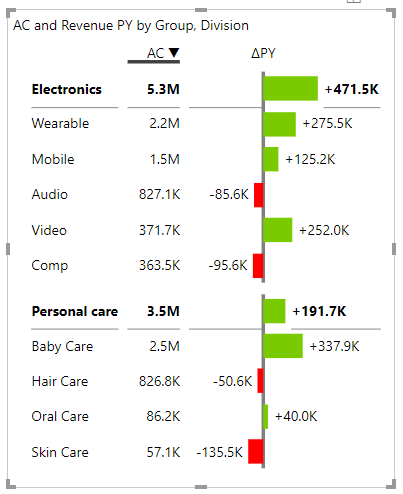 Arria NLG's add-in for Power BI automatically creates narratives for your data. It analyzes your data to create natural language narratives. You can set various configurations to select the level of detail to share or even use the NLG Studio to program your narratives down to the smallest detail. You can add your specific knowledge for your industry to drive compelling stories or just highlight the most important facts. This is truly one of the more interesting custom visuals out there. 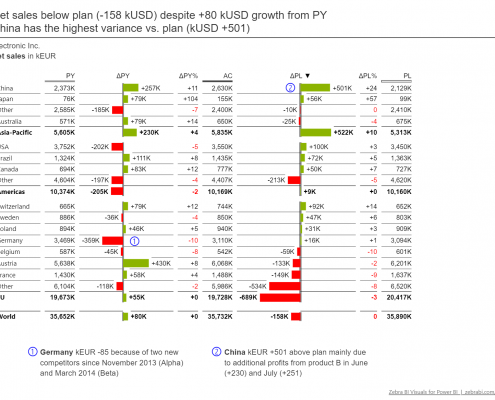 Power Planner Visual Planning is a powerful tool for budgeting, planning and forecasting. It allows corporate users to see a data visualization as they are entering data. When they change or add data in a dashboard or a report, it changes interactively. This makes it easier to adjust projections and forecasts and observe the impact immediately. A list of custom visuals for Power BI would not be complete without our own Zebra BI for Power BI. 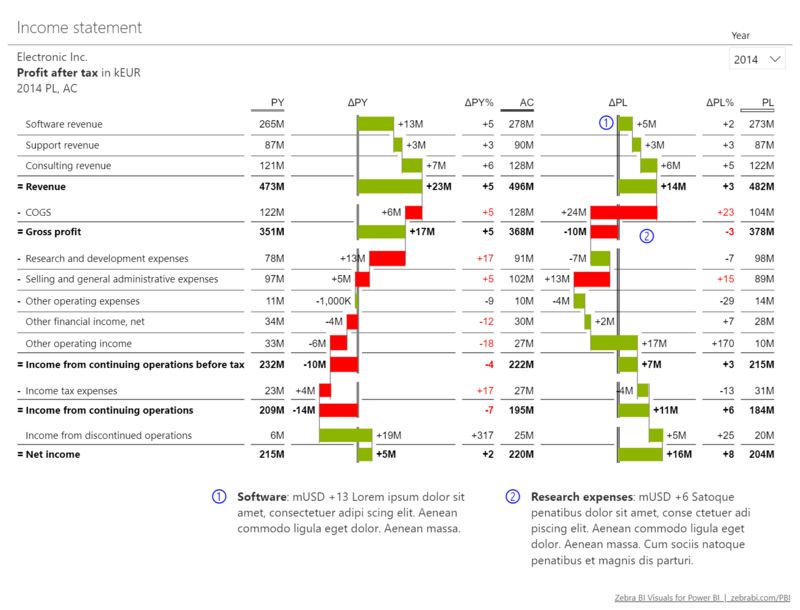 These extremely advanced visuals enable you to create convincing financial reports that make a point and reveal hidden insights. 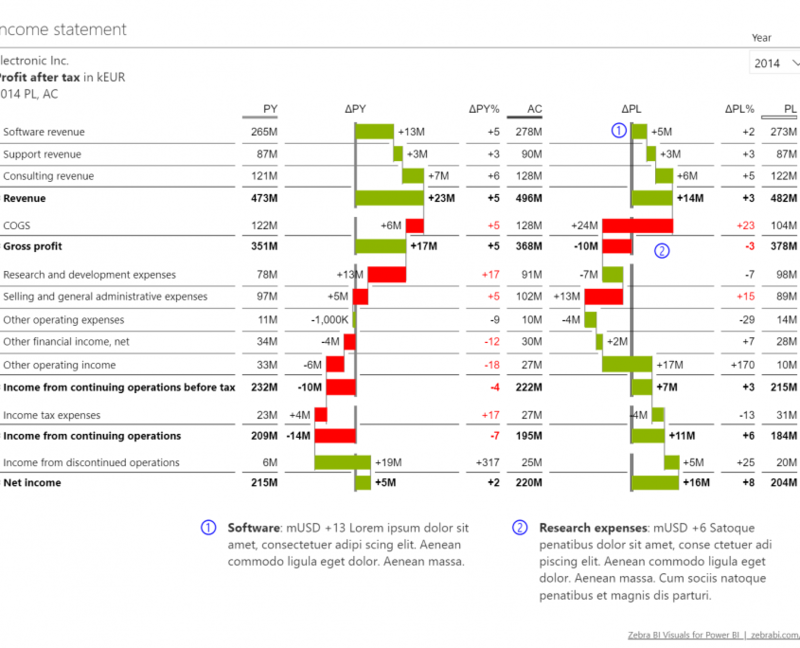 They are the first and only IBCS®-certified visuals on the market and allow you to create complex visual reports that combine waterfall charts, small multiples and other advanced features. Fully responsive and interactive, they allow you to take meaningful decisions based on actionable insights. Don't just take our word for it, go ahead and sign up for a free trial. The solution is so powerful even Microsoft uses it internally for their reports. Kontroling Kognosko is where the event will take place, presenting the latest trends and best practices of financial and business reporting. 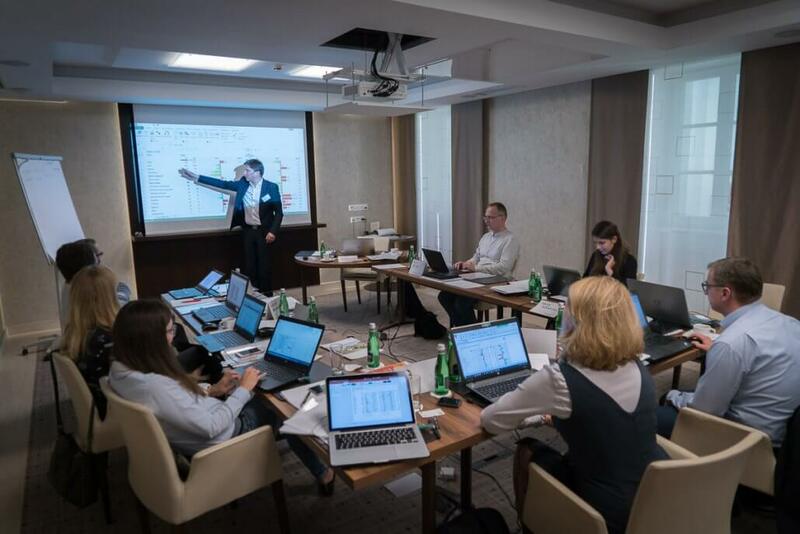 Our CEO Andrej Lapajne will lead the first full-day training on financial reporting in Power BI with Zebra BI visuals. 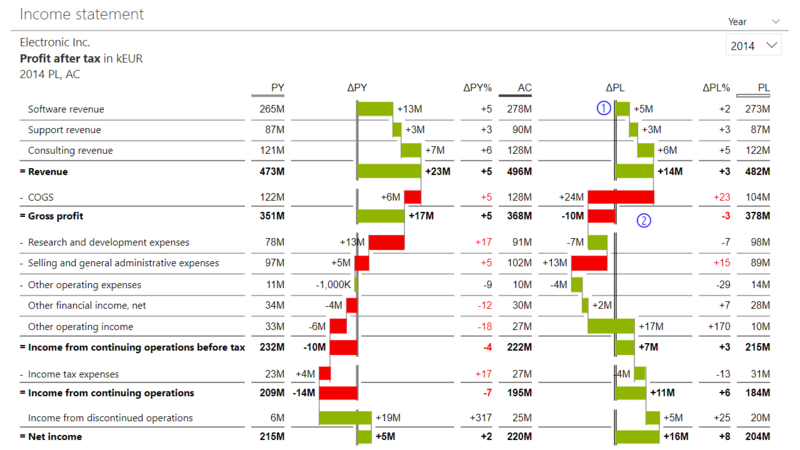 With a ton of examples, modelling best practices, DAX tricks, and advanced data visualization methods, we will systematically teach you how to build beautiful P&L statements, actual vs. budget dashboards and other business reports in Power BI. From scratch! We will show you how to use #PowerBI's and #ZebraBI's bells & whistles such as smart page tooltips, drill-through et al in the most productive way. Tips&Tricks: Smart tooltips, Drill-through, Bookmarks, etc. Very much looking forward to seeing all of you there and getting to know you. 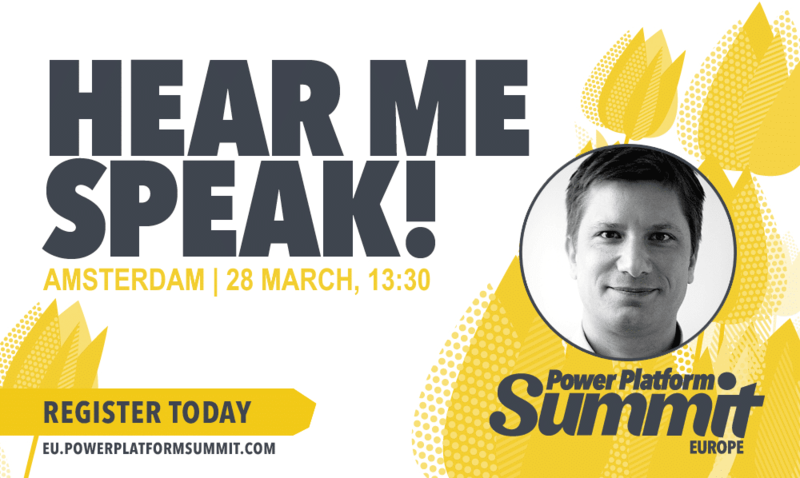 We are excited to announce that we'll be present at the can’t-miss Power Platform Summit in Amsterdam, the biggest event for users of the Microsoft PowerBI, PowerApps and Flow in Europe this year. Make sure to use our promo code PRPZEBRA when registering to receive a 10% discount. We'll be presenting our most popular session on Power BI DAX tricks at the Power Platform World Tour in Washington DC on April on April 1-2, 2019. 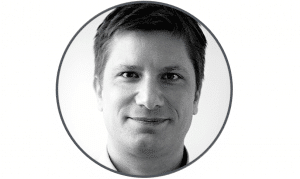 Andrej Lapajne, the CEO of Zebra BI will present his lecture titled "Top 5 DAX Tricks for Super Effective Power BI Dashboards" live at the Power Platform World Tour in Washington DC. The event is bringing unprecedented access to premium Power BI, PowerApps and Flow content designed by your local industry experts. Join our lecture and make sure to meet Andrej in person for a chat! One of the questions we get most often by our users is how to create a switch in their Power BI dashboard that would let them switch between Monthly and YTD views. You can do this by using Data Analysis Expressions (DAX), which is the formula language used throughout Power BI. This blog post will provide a quick overview of what you need to do to create a simple switch. Before you start, download the examples from our webinar page for Top 5 DAX tricks for super effective Power BI dashboards. We also recommend that you watch the video as it also contains detailed step-by-step instructions for preparing your data and tables that are not covered in this post. Start by opening the Sales Dashboard example (SalesDashboard-ZebraBI-webinar.pbix) from the zip file you downloaded. Open a new page by clicking on the + icon on the bottom of the start page. The example already includes all the tables, relationships between them and code, so you just need to recreate the basic sales dashboard you will add the Monthly/YTD switch to. 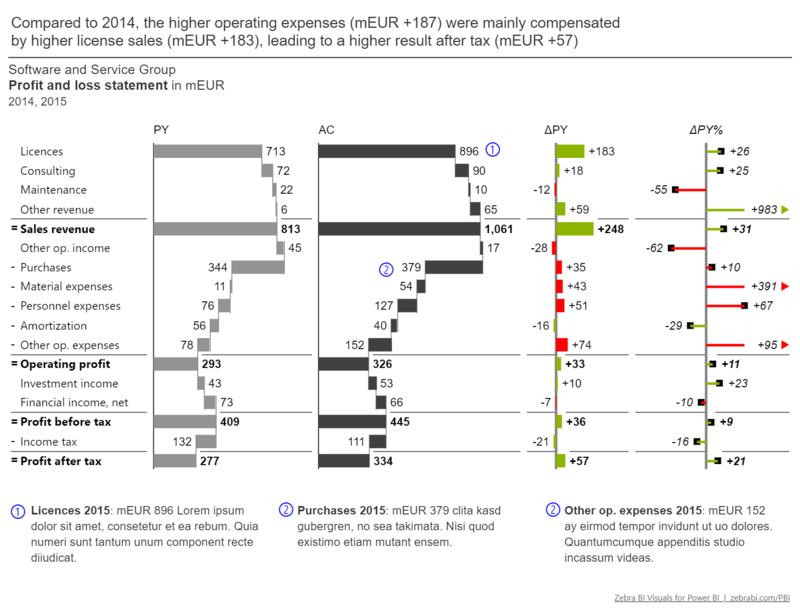 This table adds a comparison of actual results to the revenues from the previous year by individual product groups and divisions. This visual is fully responsive and also controls the small multiples visual on the right that you've created in the previous step. If you click on a category, the chart on the right will change to display just the selected category or group of categories (division). With this, you've already created a great visual. However, we can make it better. Next stop is adding two slicers: Year and Month that you can use to switch between views for individual months and years. Click on Year field in the Calendar group and drag and drop it onto the dashboard. Switch it to the Slicer visualization and select Dropdown option from the menu. Add another slicer for months. Click on Month field in the Calendar group and drag and drop it onto the dashboard. Switch it to the Slicer visualization and again select the Dropdown menu item. This will break your visualization. To fix it, you need to decouple the time series view from your slicer. Click on the month slicer and select the Format tab on your ribbon. Select the Edit interactions tool. This shows additional controls on the dashboard, where you can control what impact the selected visualization should have on the others. To prevent the currently selected visualization element from impacting your small multiples chart, you should select the no impact icon. Now, we will add the Monthly/YTD Switch. Switch to Data view and add another table for the switch on the dashboard. 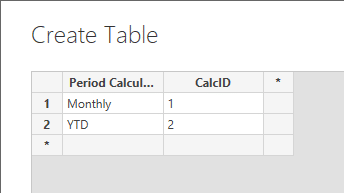 Go to the Relationship view, where you will create what is called a "disconnected table" and serves as a switch between two values. Click the Enter Data button in the Home tab and name it Period Calculation in the Name field on the next screen. You need to create just two columns - Period calculation and CalcID. You now have a new table in your project that is available for you to select in Report view in Power BI. 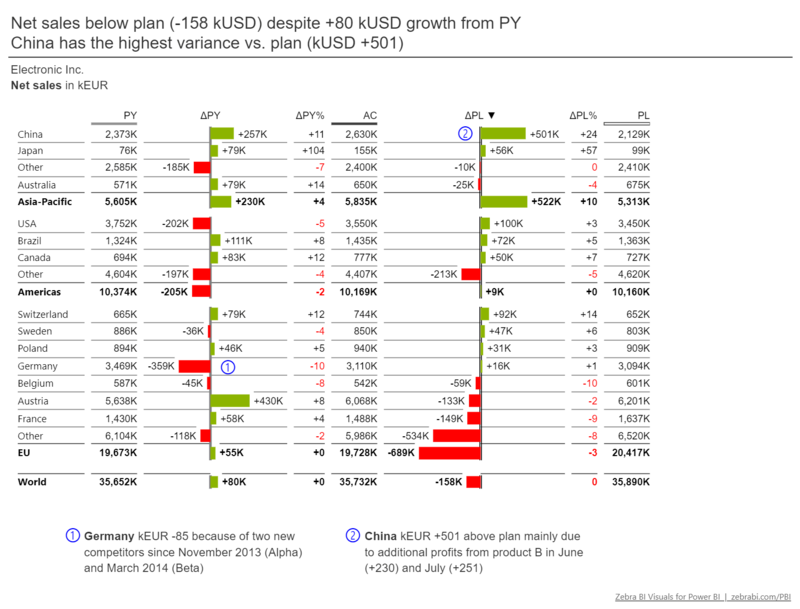 Drag and drop the Period Calculation field onto the chart and switch it to a slicer element. You get two options - monthly and YTD. Switch to Horizontal orientation under General option in the Formatting tab. You now have a slicer with two options (YTD and Month). You click between the two although the options do not do anything yet. Just to explain briefly, what these functions do. SWITCH returns different results depending on the value of an expression, in this case AC filtered element in your project. If the value is 1, the expression returns the AC filtered value. If the value is 2 it calculates revenue to return the YTD value for which the DATESYTD function is used. Make sure you download the free trial! 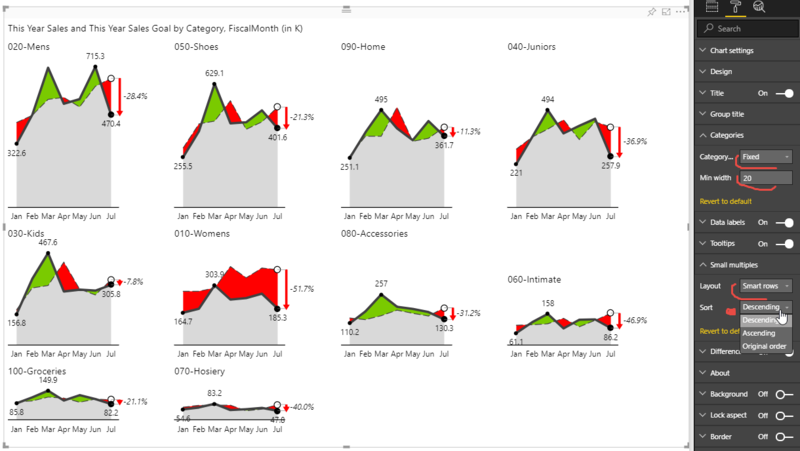 In addition to out-of-the-box support for IBCS standards, Zebra BI visuals for Power BI feature 1-click data sorting, powerful outlier handling, advanced small multiples, responsive visuals, improved navigation, and full customization. With support for Power BI, best practice reporting is now available on the desktop and mobile and in the cloud. 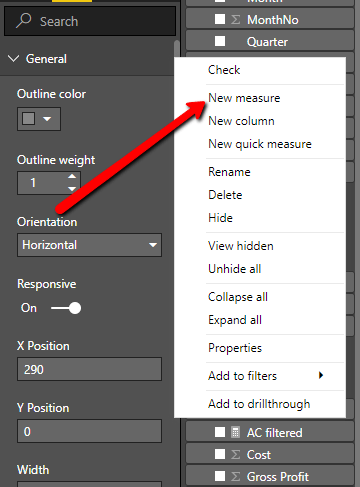 As you work with Zebra BI Power Tables you might want to change the default order of columns. While the default ordering is based on best practices and standards prescribed by IBCS, companies very often have reporting standards which define a proprietary order of columns or simply need more flexibility. For example, data for the previous year should be displayed to the left of Actual results or to the right. With the latest update, you no longer have to worry, just simply drag and drop columns to reorder them. Use this feature to add a new level of flexibility to your IBCS-compliant reports and dashboards. Our visuals now support virtually any customization you might need to create powerful and convincing data stories. Top/bottom N feature shows just the most significant items and reduces the visual clutter. To make a point, sometimes you just want to show the most significant items and reduce the visual clutter. 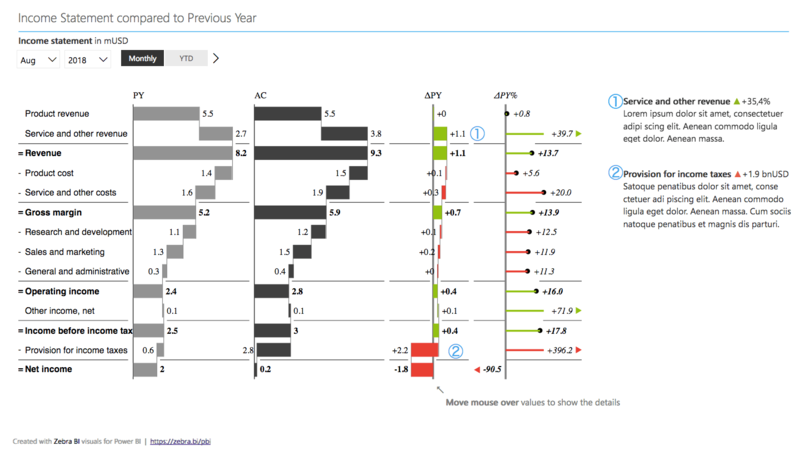 To help you do just that, we've added the Top/bottom N feature to our waterfall charts. Once you toggle the option On, you simply select the number of top or bottom values you want to display and the chart adjusts automatically. How to use this option? Once you have your waterfall chart, click the Format tab in the Visualizations pane. Open the Categories group and toggle the Top/Bottom N switch into the On position. Afterwards, you can set the number of items that need to be shown. Other items are merged into a single group named Other. This feature helps you focus on the most important data points while reducing visual density to improve chart readability. 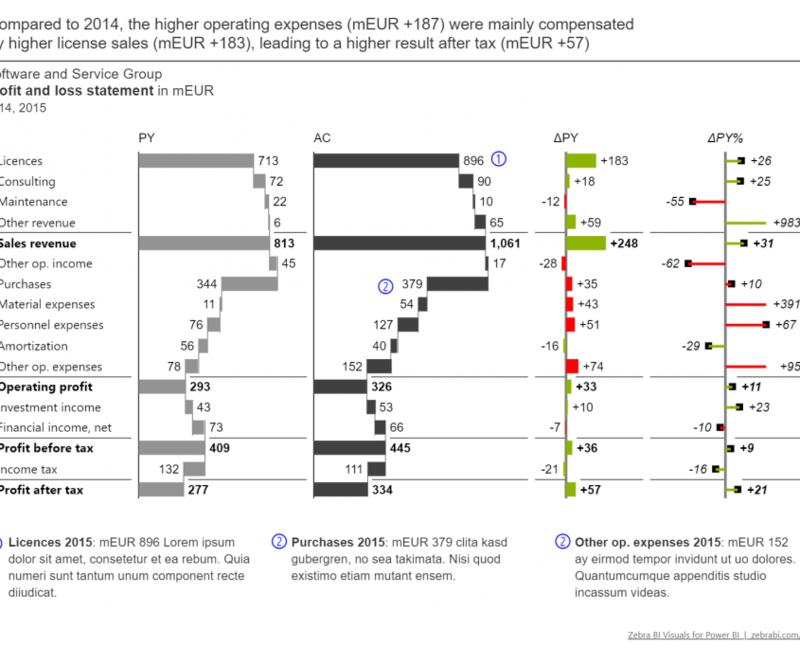 Everyone hates it when the labels on their charts overlap and ruin an otherwise perfect visual. We've added an advanced algorithm to Zebra BI PowerCharts to prevent this. When you are working with a narrow chart that cannot accommodate all the labels, the visual will hide them automatically. Labels appear again once you resize the chart or switch to the Focus mode. This ensures optimal label density depending on your context and situation. To turn this feature on, select your chart and click the Format tab in the Visualizations pane. Open the Data labels group and select Auto from the Density dropdown menu. Small multiples mode now supports charts combining multiple chart types (bar and lollipop, for example). 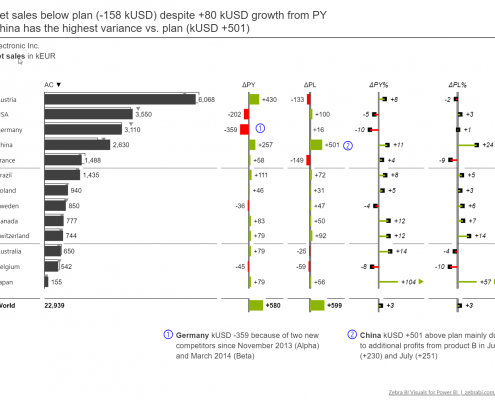 To use this feature, select your chart and click the Format tab in the Visualizations pane. Open the Chart Settings group and select either "Absolute / Relative", "Actual / Absolute" or "Actual / Relative" from the Layout dropdown menu. At the same time, we've added the Top N + Others option to the small multiple mode. It works similar to the feature described above by showing only the most important charts and combining the others into a single chart named Other. To use this feature, select your chart and click the Format tab in the Visualizations pane. Open the Small multiples group and select an item from the Top N dropdown menu. Then, set the number of items you want to have shown. Sometimes you want to track a difference in a KPI that has very small variations, you can now break the axis in line and area charts to emphasize otherwise minor variances. 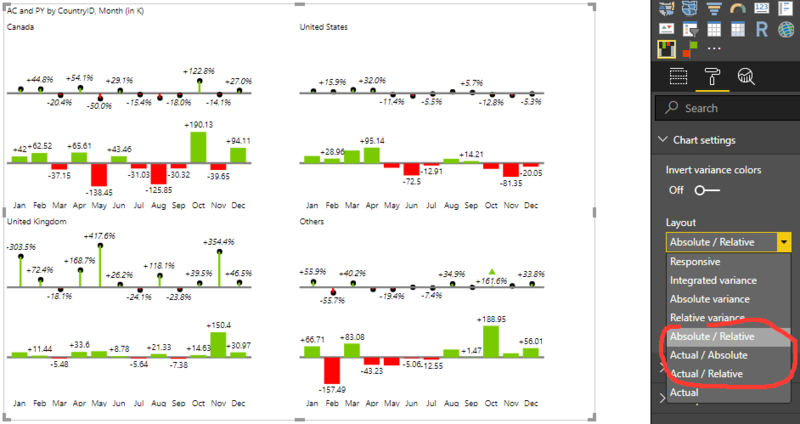 The feature works on individual charts as well as small multiples. Our advice is to be careful with this feature, because it artificially emphasizes differences where there might not be any. However, you might find this feature useful if you want to focus on the trend of a variance or a similar feature of your data. You can find the axis break option in the Format tab in the Visualizations pane under the Axis break group. Turn the feature on with the toggle and set the Percent value - lower values might result in a better display of very low data labels. Zebra BI Visuals, the only IBCS®-certified software solution for Power BI, has just been updated to version 2.0. This release is available for existing subscribers as well as a free trial and delivers improved comparisons and more options for formatting and designing data. Note: Version 2.0 of Zebra BI visuals for Power BI takes advantage of the latest additions to Power BI core, so it requires August update of Power BI Desktop. Older Power BI versions still work with version 1.3. 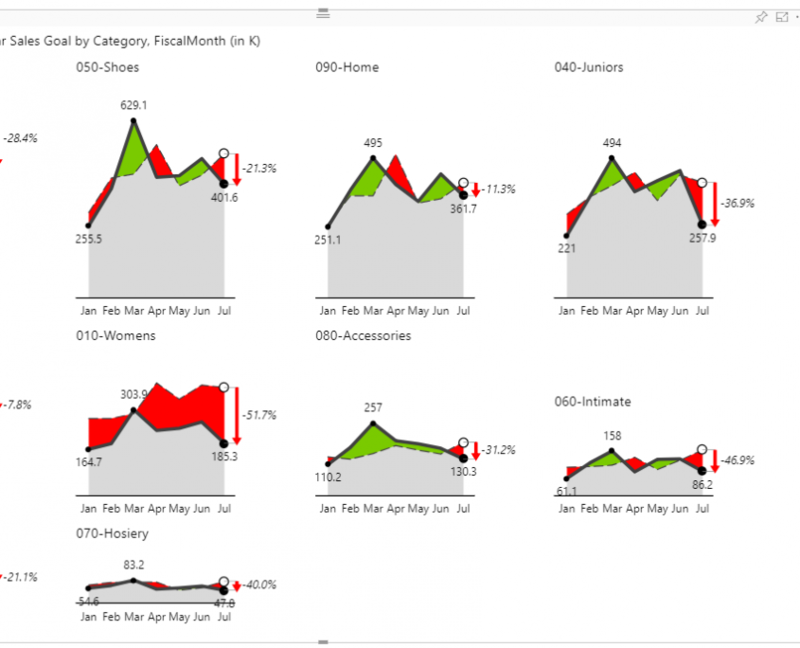 Now you can make your Power BI reports even more user-friendly. Use report page tooltips to display additional information when a user hovers with his mouse over a specific data category. 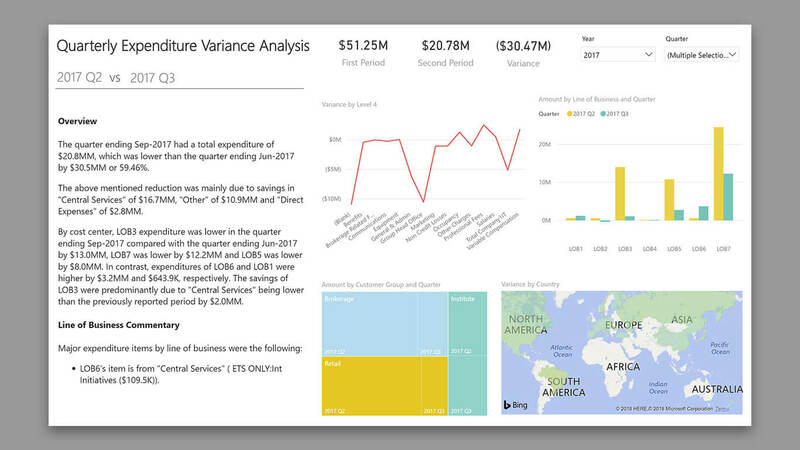 More info about using report page tooltips with Zebra BI visuals for Power BI is available here: https://zebrabi.com/pbi/use-report-page-tooltips-provide-details/. Zebra BI Visuals, the only IBCS®-certified software solution for Power BI, has just been updated to version 1.3 that brings several exciting new features that make it easier to create convincing and clear visual business presentations in Power BI. In addition to out-of-the-box support for IBCS standards, Zebra BI visuals for Power BI feature 1-click data sorting, powerful outlier handling, advanced small multiples, responsive visuals, improved navigation and full customization. With support for Power BI, best practice reporting is now available on the desktop and mobile and in the cloud. Good news for everyone searching for a way to bring IBCS®-compliant charts and tables into Power BI! 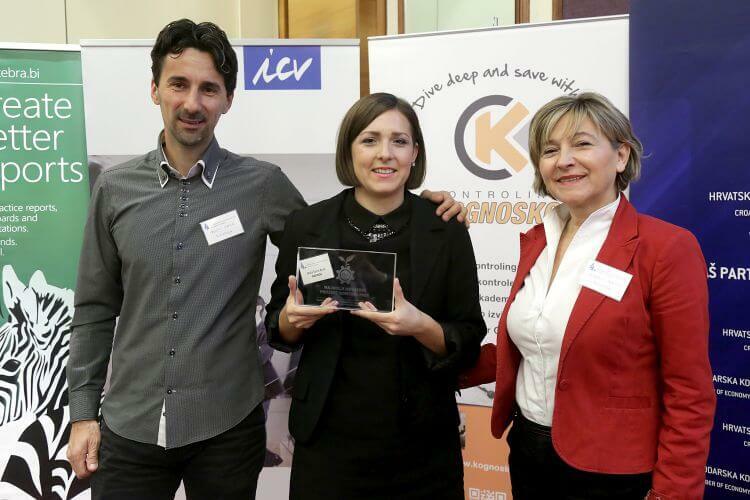 Zebra BI Visuals for Power BI has achieved a major milestone by receiving the IBCS® certificate to ensure that business information is presented clearly, concisely and consistently across the cloud, mobile and desktop versions of Power BI. This achievement is another step towards the vision of delivering meaningful one-click visuals to users where they need them the most. 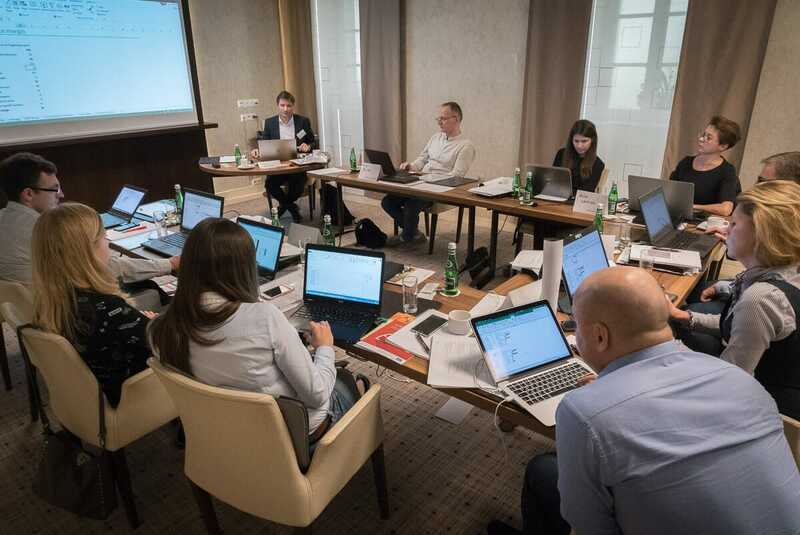 "We've worked hard on Zebra BI Visuals for Power BI as we wanted users to have access to the best visual design elements they need for powerful data storytelling," said Andrej Lapajne, CEO, Zebra BI. "We see Power BI as a powerful business intelligence tool of the future and having our product IBCS®-certified underlines our commitment to the platform." IBCS certification process is carried out by BARC, the independent research and consulting institute for business software. The examination is carried out in two stages: compliance with IBCS® and ease of use. In the first stage, software providers need to show the required level of compliance between visuals delivered by their software and the required standard as prescribed by IBCS®. In the second stage, the software is evaluated in terms of how easy it makes creating new templates from scratch without programming and using default features. The certification team was most impressed by what we would like to call 'business-responsive design'. 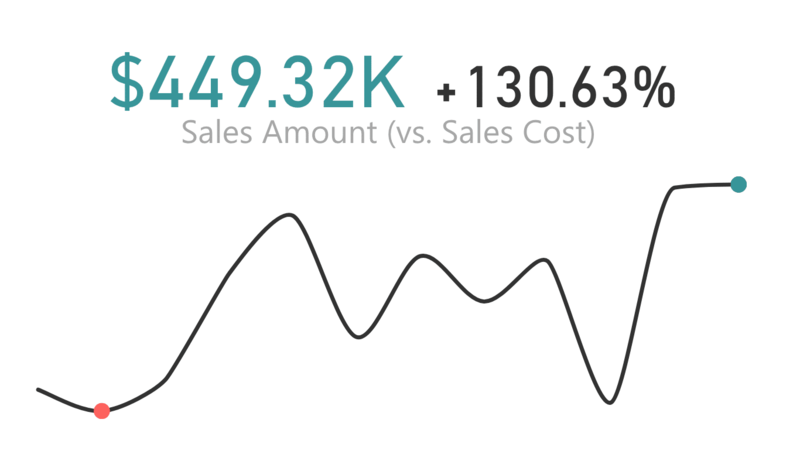 Zebra BI Visuals for Power BI dynamically create IBCS® compliant charts providing maximum business insight within a given space. The 2017 AFP Conference, the most important event for treasury and finance worldwide, which attracts more than 6,500 finance professionals every year, will be held on Oct 15-18, 2017 in the San Diego Convention Center in San Diego, United States. The AFP conference is a yearly boost of knowledge for finance professionals., It's about connecting or reconnecting with peers, and staying up to date on industry issues. Sessions, tracks, speakers, and networking events are customized for all aspects of treasury and finance. Visitors hear from colleagues who tackle many of the issues they face daily, and learn about their best practices so they can implement them upon their return to the office. Time spent at AFP 2017 is an opportunity to gain practical knowledge, discover innovative solutions and validate best practices. At no time in our profession has it been more important to stay ahead of the tech curve. Moreover, it's our mission at AFP to ensure our members are prepared to leverage these rapidly evolving technologies in order to maximize their full potential in their organizations. AFP MindShift aims to unite the innovators, disruptors and macro-trend experts in a formal task-force that will transform the role that technology plays in corporate finance and treasury by developing solutions that drive future profitability, reduce risk, and improve operating efficiency. MindShift will be highlighted at the AFP 2017 annual event through identifying certain educational sessions, speakers, and networking events that are deemed a 'MindShift event' given the topic is viewed as innovative or disruptive. Lastly, the MindShift Row of exhibitors will feature only the most future looking technology solution and service providers exhibiting at the event. We now set our minds on becoming the go-to software for Financial Planning & Analysis (FP&A) professionals in the US market. If you plan to visit this year's AFP conference, we'd love to meet you. You'll find our exhibitor booth in the MindShift Row. More than 230 leading service providers will showcase their latest products and services that enable companies to streamline operations, cut costs and create business efficiencies. Meet us for a live demo at our MindShift Booth! Zebra BI is the IBCS certified Excel add-in that helps create best-practice business reports, dashboards and presentations in just a few clicks. Zebra BI makes financial reports crystal clear to all levels of management in real working conditions where reader's available attention is limited. Download your 30-day trial here: https://zebrabi.com/free-trial/. It's here! We're pleased to say that today marks the release of Zebra BI 2.0, the most revolutionary software for finance professionals since the launch of Zebra BI in June 2014! On Friday, March 31, 2017 Andrej Lapajne (CEO at Zebra BI, ICV member, IBCS Association founding member) will give a keynote presentation about best practices in designing reports, dashboards and presentations at XI. International ICV Congress in Warsaw, Poland. 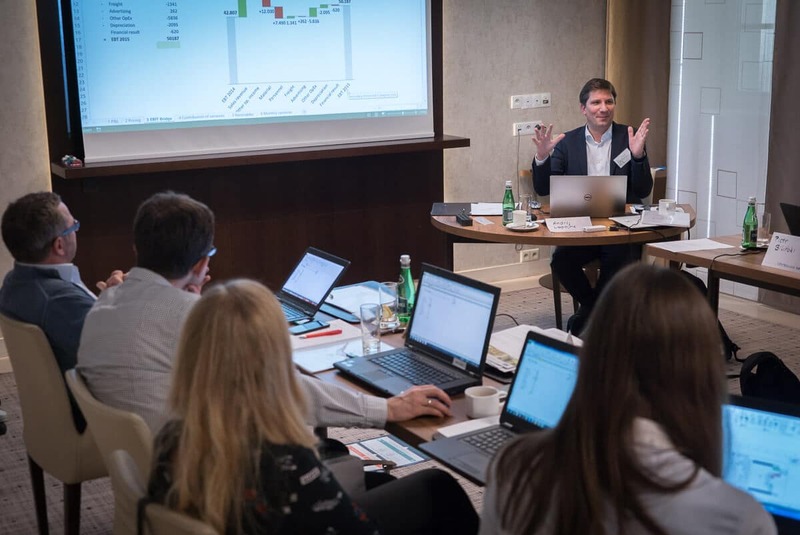 In a presentation entitled 'The Traffic Signs for the Management; Best Practices in Designing Reports, Dashboards and Presentations' Andrej will present practical business cases from some of the world’s leading companies. Examples include advanced sales analytics, profitability analyses, cash-flow forecasts, ROA-trees, trend analyses and more. They all have one thing in common: a clear and efficient visual design, according to the recommendations of the International Business Communication Standards (IBCS). 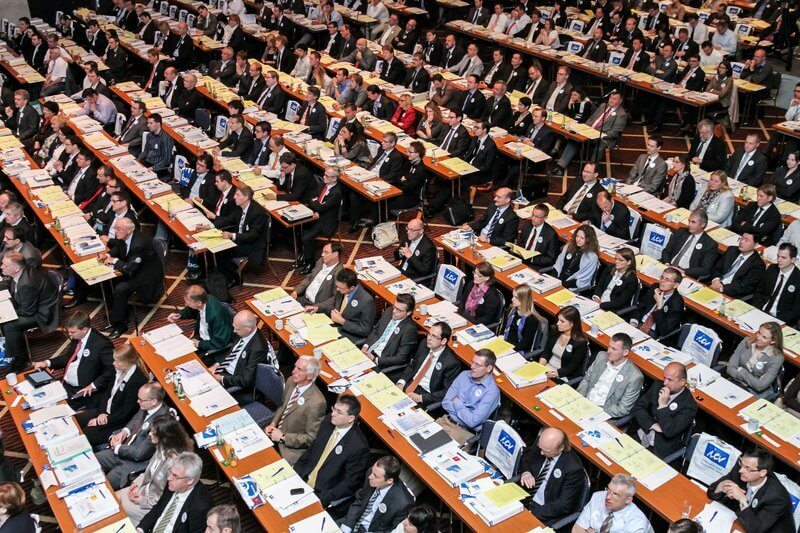 The 42nd ICV Controller Congress, the largest event for finance professionals in Europe, will be held on May 15/16, 2017 in The Westin Grand Munich Hotel, Munich, Germany. This year's congress, which is entitled “Agile controlling in digital reality: Managing upheavals successfully” will take the participants into an agile reality. In the attractive agenda you will find relevant and up-to-date topics, presented by successful top managers and controllers from well-known companies. 2016 was the year of the product releases. Well, heck, so were the rest of them 😉 And so will be the next one. We can't help it, we're the product people. The 4th International Controlling Conference in Croatia will be held on 8th of November 2016 at Westin Hotel in Zagreb, Croatia. The main topic of this year's conference, which is entitled “The Future of Controlling Has Already Begun”, is inspired by economic development influenced by global changes, and controlling has a major role to play in this regard. IBCS Annual Conference 2016, the place where IBCS professionals share their experience, will be held on June 3rd at Mamaison Hotel Le Regina in Warsaw. The conference will enable employees from finance and IT departments that are in the process of implementing the IBCS Standards to meet their peers, thought leaders, consultants, and software developers. The marcus evans Corporate Performance Management conference will be held on May 24th and 25th 2016 in Berlin, Germany. It will serve as an excellent opportunity to engage in discussions on topics such as how to redefine performance management in a global company, extract knowledge from data with the creative use of analytics, challenge your KPIs and improve processes.